Smoke it and they will come! 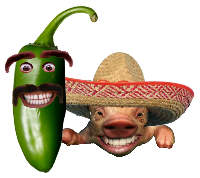 Welcome to my smoking meats recipes site. 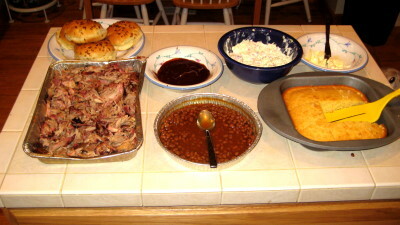 Visit my recipe list for the complete list of smoked foods. My smoked meats recipes will be changing indefinitely as I plan to improve existing recipes and add new ones on a continual basis. Whether you are new to smoking meats or you are a seasoned veteran, I hope to provide a little something for everyone. All recipes within this site will contain detailed preparation instructions and video shot in HD to clearly demonstrate the specific tips and techniques I used to smoke the meats. 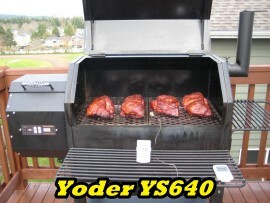 Be sure and stop in frequently and browse the smoking meats recipes. All new recipes will be tagged with “New Smoke” labels so you can quickly navigate to the recipes of interest. Remember… Cooking times will vary so always use a thermometer. Trim most of the excess fat off the Pork butts. Rub pork down with Olive oil. Liberally coat the entire Pork Butts with yellow mustard. Shake on some Dried Tomato & Garlic Pesto mix. Liberally coast the pork butts with McCormick's Sweet & Smoky dry rub. pour some apple juice into a spray bottle and lightly mist the pork butts. Sprinkle on some brown sugar all over the pork butts. Shake on a bit more of the Dried Tomato & Garlic Pesto mix. Wrap in plastic wrap and refrigerate over night. (12 hours or more). Following morning early... I start at 4 AM. Use a injector and inject the Pork butts with a fair amount of apple juice. Let stand at room temperature for 1.5 hours. Place pork butts in smoker fatty side up. Mist hourly with apple juice. Cook roughly 1 hour per pound. Turn the pork butts after 5 hours. 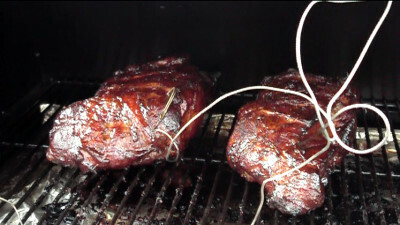 When the pork reaches 175 degrees remove from smoker and place in aluminum tins. Add a cup to 2 cups apple juice for humidity and cover in foil. Place back into cooker. Remove foil when meat reaches 195 degrees. Drain the fat from the tin and add some apple juice. Finish cooking until pork reaches 200 degrees. Don't worry! This is not too hot, in fact it will produce the most amazing pulled pork. Cover with foil and let stand 30-40 minutes. This is a great time to put some beans into a pie tin and place in the smoker. Stir them every 15 minutes until pork is ready. 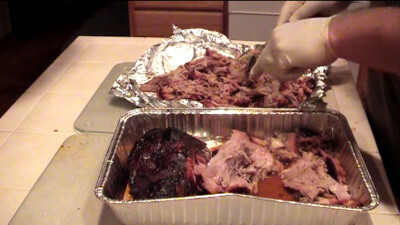 When pork is ready, using a forks, pull and shred the pork. Pull off any fat and put aside for your dogs. There should be very little fat. most of it should have rendered down. Serve with onion buns, beans, coleslaw and corn bread. All donations go toward maintaining this site and improving the content.